For the first time, we head north of the border to Scotland! And whilst Gus, Oliver, and Charlotte come along for the ride, our expert guides are Tom, Jo, Ellie and Tanya from SCAPE, whose Scotland’s Coastal Heritage at Risk Project (SCHARP) was the inspiration for CITiZAN. This week it all gets a bit muddy, as we explore the banks of the tidal River Clyde. This episode blew my mind, as it seems totally ridiculous that a river that built and launched some of the world’s largest ships could be WADED ACROSS just a couple of hundred years ago. As ever, there was so much we couldn’t fit in to a Channel 4 hour. So here are some links to help you delve a little deeper into the fascinating archaeology and history of the Clyde. This is the home of the MUD PUNTS (impossible to say this without a twinkle, for some reason…), the SCHOONERS, and THE DIVING BELL BARGE. A veritable treasure trove, capturing the history of the deepening of the Clyde, and the growth of Glasgow as a city. BALT crew filming at the Timber Ponds. This was before the tide started to come in, and I had to do my ‘pensive wading’ shots. The Timber Lords were the money and power behind the early growth of Glasgow. The sheer extent of the timber ponds,even just the stumps in the mud that remain, are testament to this wealth. What we didn’t touch on, and what I wish we had, was the dark side to this trade wealth: slavery. and just as a very brief insight into how slavery was a key component of the tobacco trade into Glasgow, see this search within The Transatlantic Slave Trade: A History by James A. Rawley and Stephen D. Behrendt. The Lang Dyke was the 18th Century engineering solution to the Timber Lords’ problem of not being able to get their ships close to the city. A Biographical Dictionary of Civil Engineers in Great Britain and Ireland edited by A. W. Skempton. Thanks to Tanya T-dog Venture for this fine Lang Dyke meme. Walking Through Time is being repeated! Episode 1, Scotland’s Lost Asteroid, is being broadcast again at 8pm, Saturday 29th April, Channel 4. It is almost a year since we were filming in that incredibly beautiful part of Britain, and as I was just up there for a holiday I can report that the scenery is just as stunning, the people as welcoming, and the geology as awe-inspiring as it was when we filmed. Dr Mike Simms has been continuing his research into the impact crater, and tells me, “there are hints that [it] might be much bigger than first thought”, which is pretty exciting — keep your eyes peeled for a publication in the next few months! And after seeing our programme, the town of Lairg is putting on a special exhibition all about the impact crater. Local artist Emma Armstrong has been working with Lairg Primary School, and they produced three wonderful info boards for the exhibition (more on this below). The Northwest Highlands Geopark, which covers the entire area we filmed in — one of the most geologically important areas IN THE WORLD — is at risk of losing its UNESCO status. It needs funds to bridge gaps in its staffing budget, to enable people like Dr Laura Hamlet who helped us out no end with filming (and was brilliant on screen — watch her, you’ll see!) to continue their excellent work in engaging locals and visitors alike with the geology that underpins their lives. It is shocking that their core funding, when they do so much for the region and the nation, is so precarious. But back to the good news. 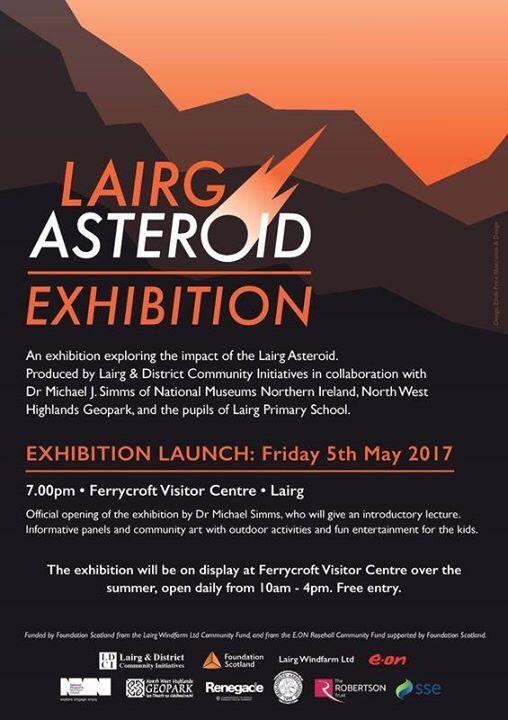 Lairg has fully embraced its new claim to fame as the site of Britain’s only terrestrial asteroid impact crater, and next week — quite by coincidence — the village is putting on an exhibition at the Ferrycroft Visitor Centre all about the asteroid, and the unit for the impact crater. I am dead chuffed that our programme has really resonated with the communities that we filmed in. It is exactly the *cough* impact that I hoped for. Yes, big viewing figures are great and all that, but touching peoples’ lives directly in this way is so much better. Cockles of my heart suitably warmed. So to bring this back to the Geopark, and why it is important. Telly is all well and good as a one off, but the work that Laura Hamlet and the rest of the NW Highlands Geopark staff do is important *every day* on the ground. They devise tourist trails, lead tours, talk with school children, and in doing so they enrich the lives and experiences of so many people. Landscape, and the geology which underpins it, is so much more than just a pretty backdrop fro a holiday snap (though that is very nice). It informs how people live their lives, and understanding it gives us a deeper appreciation of the world we live in. Please help: donate if you can, and even if you can’t help spread the word. Use the #lovethegeopark hashtag on Twitter and Facebook, and share the link to the crowdfunder wherever you can. Thank you everybody who has tweeted and emailed to say that you enjoyed Walking Through Time: Scotland’s Lost Asteroid. I am so glad! Where did you get your cardigan? By far and away the most common question! I bought it on holiday in Iceland a couple of years ago. It is my favourite cardigan. It has magical norse properties, being both warm in winter yet amazingly breathable in summer. It can also withstand being worn for five consecutive days of 12+ hours of filming, yomping over hills and knochans in the blazing sun, without getting smelly (apart from its own lovely sheepy scent). Sadly it now has a hole in the elbow. I am devastated as I don’t know if I will be able to fix it. But I will try to source some of the same wool to darn it (anyone going to Iceland?). What is in your back pack? Typical contents of my Walking Through Time back pack! Shockingly, some of you think I had a back pack stuffed with newspaper! I have heard tales of outdoorsy presenters filling their bags with bubblewrap, but my back pack was actually in actual, proper use. We were out all day, and had to walk quite long distances, so had to be prepared in the same way you would on a hike. And anyway, nothing looks more rubbish than an unweighted back pack! My climbing helmet and head torch: you never know when you might want to look at an unstable cliff face, head into a cave, or furtle around in the dark corners of museums. and between shots, I also carried whatever camera kit and extra water and food for the crew that I could manage. That’s why there are a few unsightly moments where my bag looks rather poorly packed — I had just whipped out the kit and not rearranged my bag so it was weighted properly! Where was Scotland 1.2 billion years ago? And what was it like? The best person to turn to for this answer has to be the father of Torridonian geology, Sandy Stewart. The figure, borrowed from his book, shows the location of what is now Scotland at 1.2 billion (when the Stac Fada member was laid down, forcing its way between the sands of the ‘Stoer Group’ of Torridonian sandstones), and then at 1 billion years ago (which is when the bulk of the Torridonian sandstones — the ones that mountains like Stac Pollaidh are made of — began to be deposited). 1.2 billion years ago, the Assynt region of Scotland was on the edge of the ancient continent known as Laurentia, at a latitude of around 25ºN. The sea was maybe a few hundred kilometres away. The climate was probably equivalent to a subtropical steppe — nice and warm, not too wet but not too dry either! The earlier Stoer deposits were lain down by rivers, so imagine a huge river system perhaps, flowing towards the west. But, and this is, key — there is no terrestrial life. No plants fringing these rivers, and certainly no animals swimming with them, or moving beside them. I fact, imagine a river flowing on Mars (but with a subtropical climate! ), and you’d be close. Later on, after the impact (and perhaps because of the impact), the drainage shifted and a lake formed. So tranquil waters in a quiet world, undisturbed by the call of a bird, or the chirrup of an insect, or even by the sound of the wind in the trees. Empty and still. I think I have found a meteorite, what do I do? If you have found a possible meteorite (how exciting), the best thing to do is to take it to your local museum and ask them if they can help to confirm your discovery. Or you can ask experts at the Natural History Museum in London by using the online identification forum NaturePlus. You’ll need to take a picture (make sure you include a scale to show its size — a coin or a pen will do, if you don’t have a ruler handy), and also include as much information as you can about where you found it, and when. Can you identify a rock, or a geological section for me? I am afraid not — unless you have found an elephant fossil, then I am your woman! As with putative meteorites, the best thing to do is to take it to your local museum and ask them if they can help to identify what you have found. Or join the online identification forum run by the Natural History Museum: NaturePlus. You’ll need to take a picture (make sure you include a scale to show its size — a coin or a pen will do, if you don’t have a ruler handy), and also include as much information as you can about where you found it, and when. You can also download the new Natural History Museum Fossil Explorer App, which allows you to find out about the geology in your area and also provides guides to most commonly found fossils! This is a useful first step to understanding the rocks and fossils under your feet. If you want to get into more detail, join the Geologists Association. They run field trips, and have a brilliant magazine. They also produce the brilliant RockWatch magazine for younger members. Where was that spectacular fishing spot in Assynt? Will there be a DVD of the series? I am afraid I don’t know. I hope so, as I would like one (and so would my Mum! ).